I recently attended a conference that was unlike anything I have experienced. We felt as though we needed to be there, yet, it was not one of our best conference experiences. The folks who ran the conference did not always display Christ-like behavior from the podium. However, there was one thing they did that stood out from all other organizations I have encountered. When it came to giving, they were fanatical. Now, when I say fanatical, I don’t mean the casual fan who wears their favorite team’s t-shirt on a Saturday afternoon. I mean, the guy wearing nothing but body paint in 30 F degree weather screaming at the referee for every “bad call” against “his team.” These folks were literally taking off watches, jewelry and expensive shoes and leaving them to be sold for the purpose of helping the less fortunate and spreading the good news of Jesus. The incredible part was that the more they gave, they more they received in return. The stories they shared of going from being underwater to having million dollar budgets in a matter of years were incredible. Not only that, but how they received their income could only be attributed to God. 2 Corinthians 9:7 Says that “God loves a cheerful giver.” The word cheerful means joyous! 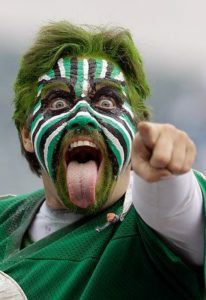 Who is more joyous than the fanatical fan in body paint, cheering his favorite team, who just punched a ticket to the Championships! They are absolutely nuts with excitement! I don’t believe it’s strange to show the same level of craziness in giving of our time, possessions and love for the sake of making sure as many people as possible know that Jesus came to this earth, so they can go know God, and His love for them, and be with Him in Heaven. As a matter of fact, being seen as a madman seems to be a requirement of “hero” status in the Bible. Noah built a boat, bigger than anything else in its time, no where near water. Ruth followed her mother-in-law to a strange land, where she would be an outcast and poor. John the Baptist was so intense that religious leaders thought he was possessed by a demon. David danced in his underwear in public and killed a giant. Paul and Silas praised God with songs whilst in prison, but refused to leave for the sake of the jailer, even when the doors were wide open. However, possibly the greatest fanatic was Jesus Himself, who condemned the pious religious leaders, but befriended the drunks, traitors and desperate; rich and poor alike. A wise man once said that salvation through Jesus was free… it’ll just cost you everything. I belief that means more than our personal belongings, but our pride, our actions, our emotions and thoughts. Being a fanatic is not a requirement of following Jesus; it means you ARE following Jesus? Let me finish by asking a tough question… If an audit was done of your life, would there be any evidence of following Jesus? Would the auditor classify you as the person with war paint and tailgating for hours before the big game or the casual fan who throws on their Jesus shirt over the weekend when expected?